I've had my eye on this color ever since I first saw the Parfumerie collection on Nouveau Cheap. 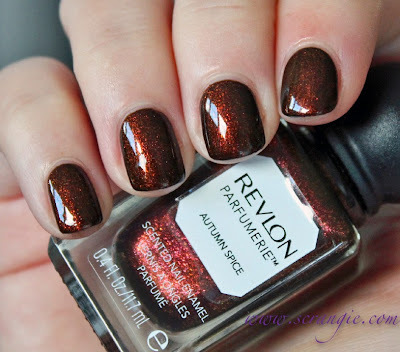 This particular shade combines several of my favorite things: multichrome/color shifting glass fleck shimmer, dark, vampy color, the words autumn and spice in the name, very attractive packaging, and a gimmick (it's scented!) to make it completely irresistible to me. Finally found it just last weekend and it's even better than I anticipated. Color? Gorgeous. Formula? Excellent. Scent? Surprisingly un-artificial and not excessively strong. Perfect fall polish. I love it. I like scented polishes, but sometimes they can be overpowering and headache-inducing. This one strikes a good balance between being noticeably scented, but not so noticeably scented that it turns your stomach because it's all I can smell. It has a spicy (duh), rich cinnamon scent. Very pleasant. I also grabbed Italian Leather and Sunlit Grass because they were buy two, get one free at Meijer. Have you tried any of these? Which other scents are good? I was thinking about getting the Deborah Lippmann Mermaid's Dream dupe but the mint scent didn't sound too appealing to me. Should I go back for it? I only bought the Mermaid's Dream dupe one, but I was soooo close to picking up Autumn Spice, too. It's a gorgeous colour! Oh this is gorgeous! Love it. I bought the Autumn Spice, Italian Leather and the Mermaid's Dream dupe even though I really don't care for mint scents or smells. I haven't tried any of them yet but Autumn Spice and I have a date tonight! What a beautiful shade! 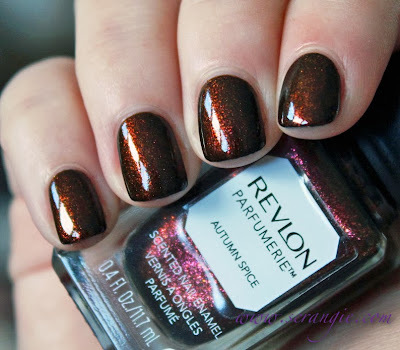 Gorgeous for fall/holiday nails. This colour is so incredibly pretty! Such a beautiful and rich color, I love it! I have fallen in love with this collection....Bordeaux is my fave....course to me it smells like wine...and I love wine! Also have Sweet Mint, Ginger Melon, Spun Sugar, and Pink Pinapple (lovely light pink). 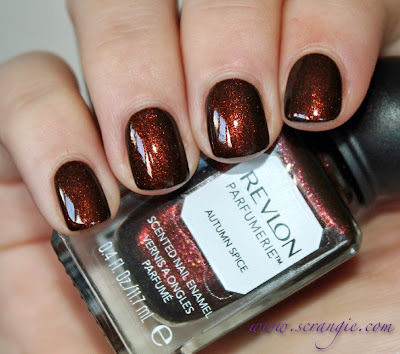 Ive been on the fence about Autumn Spice. I have the mint one, and it smells like gum to me. Like some pre-chewed spearmint Trident. But you can only really smell it when your fingers are close to your face. I also have the violet, which is pretty, but I don't care for the scent much. That is so beautiful! Every time I see this collection, I want to buy all of them. Deborah Lippmann's Mermaid's Dream is the one nail polish that changed my life, and to think of having it *scented*... well, I'll probably pick up a bottle of the dupe eventually. I doubt I can hold out that much longer! This one went straight on to my wishlist too! It is the one shade that really stood out to me. Apart from that - cinnamon smell? Yes please! I bought 3 - Autumn Spice, Wild Violets and Bordeaux. I haven't worn Bordeaux yet but I loved the other two. The colors are beautiful and I love the bottles. I have been tempted to go back for more! This is so gorgeous - much more so than the bottle would have you think! Your swatches, as always, are so lovely. You're the blog that really got my interested in nail polish blogging, and I still check your swatches for older collections. :) I reviewed all 19 over on my blog if you're curious about the scents on all of them. Swatch the other 2 u got please! Looks beautiful. I may have to try one of these. I haven't been super interested in these polishes but holy cow this is gorgeous! I think I may have to check this one out. I got the lavender one and African Violet. I have just been overwhelmed with polish. I haven't tried them yet and when I received cirque's Vesuvius. I didn't want take it off but they are next in line to try. Ooooo, I want this polish so much! I wanna sniff them all! haha The mint one in particular is on my list, actually ^_^ Go get them all! WOW I don't do drugstore brands-but I'd make an exception for this one! I have autumn spice, china flower, and bourdeux. The only scent i really like is autumn spice. The others are much stronger (at least at first) but the colors are all beautiful. Thank you for reviewing and posting swatches. Ughhhhhhhhh want this so bad! It's gorgeous! I've been lemming this one for a while, but I have a sensitive sense of smell so just the thought of scented nail polish scares me lol. I may have to cave in and buy it. Revlon recently had a 40% off sale on all of their products at Rite Aid and I bought EVERY color! So far, I've only tried: Pink Pineapple; Lavender Soap and Spun Sugar. I bought two of Autumn Spice but have not yet tried it. Will try that this week or next as it is the first color I felt I just had to have and suspected it would sell out first, given the season...I was right!!! Thank you for swatching my favorite color! It looks absolutely gorgeous on you!!! Lavender Soap is, Pink Pineapple and Spun Sugar are all wonderful BTW! Only drawback for me is that you cannot seal the color with clear on top because it will mask the scent. Fair warning, be careful about sniffing your nails in public because it can look rather odd - lol!